This project extends an existing community centre in Werribee to include new flexible learning spaces, amenities and storage space. This was achieved through the use of movable walls, and definition of space through the interior design elements. Works, which were completed in 2010, included demolition of part of the existing single storey building, and preparation of the area for the proposed new works. 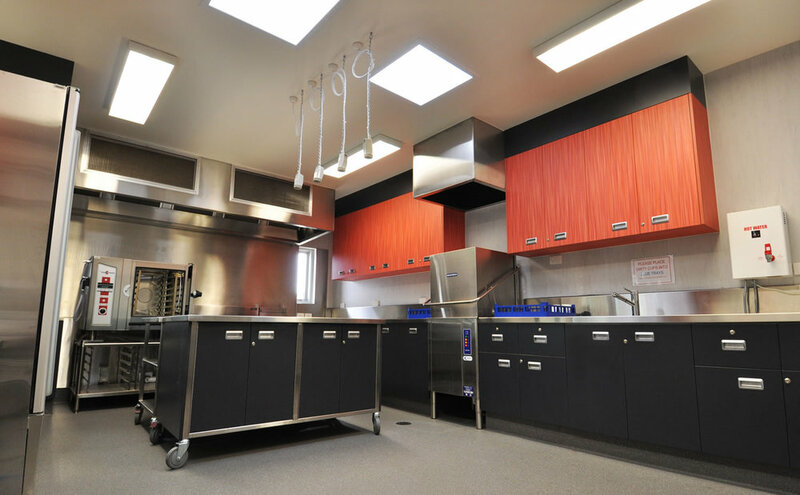 Commercial kitchen equipment serves the entire facility. New landscaping works will allow the new classrooms to open out to the external environment. The design maximises the re-use of the existing building, including the re-use of existing footings to minimise demolition and reduce carbon footprint. Other ESD initiatives include passive solar design with control of heat gain through cross ventilation, thermal mass, extended eaves for shading and high spec insulation. Spaces were designed for flexibility and finishes were selected for their environmental benefits including recycled content, low VOCs, durability and low maintenance. Water efficient fixtures and fittings and rainwater tanks supply water for a community garden from which vegetables are cooked on site. Additional landscaping included drought-tolerant native plants.